I recently went to a Patient First center to get my annual TB skin test completed for work. The nurse checked my vitals, height, weight… the usual stuff. While I was waiting she printed off a piece of paper with my BMI- turns out that according to them I am “overweight” and need to lower my BMI. On the drive home, my wife and I were discussing this issue. I don’t feel overweight, why should I care what my BMI is? What SHOULD my BMI be anyway? This discussion inspired to me to do a little research into the topic. I remember discussing this stuff a long time ago in school, but I didn’t realize physician offices actually used it as a measure of health for their patients. Let’s start with the basics and define BMI before diving into what this really means in the real world. Now that we know the math, feel free to cheat with a handy online BMI calculator provided by The National Heart, Lung, and Blood Institute. What Should My BMI Be? According to wikipedia, the equation for BMI was first developed by Adolphe Quetelet, a Belgian scholar, in the early 1800’s. More recently, Ancel Keys in the 1970’s used the term BMI as a relative indicator of obesity. A simple equation that could give each individual an idea of whether their weight was appropriate based on their height. So, apparently my BMI should be between 18.5 and 25 for me to be considered “normal” and “healthy”. At 25.6, I fall into the overweight category. I guess I should try to lose some weight…right? Well, maybe. Dropping a few pounds for me personally wouldn’t be a bad thing, but how accurate is BMI anyway? How much faith should I have in this equation to begin with? Does dividing a person’s weight by their height give us an accurate measure of what their weight should be? We all come in different shapes and sizes. Different fitness levels. What about muscle mass? So, most health professionals agree that using BMI to classify folks into the above categories based on weight has it’s flaws. Even so, The World Health Organization (WHO) uses BMI for keeping track of obesity stats around the globe. The biggest flaws with this model are that it doesn’t take into account an individual’s fitness level, and it tends to over- or under- estimate proper weights for shorter and taller individuals. Take your elite athletes and extremely fit individuals. The BMI model can’t tell the difference between muscle or fat, it only looks at total body weight. Muscle mass, generally, is a good thing! Most of us workout for the goal of obtaining more muscle mass. Being muscular is typically considered a sign of fitness and good health. But, according to BMI, having too much muscle mass can put you in a category where you are considered to be less than healthy. So, most professionals agree BMI doesn’t work very well with elite athletes. Back to the height issue. BMI tends to over-estimate obesity on tall individuals and under-estimate obesity in shorter individuals. That means that a taller person with a thin frame, is more likely to be considered overweight than a shorter a person. At the same time, a shorter person is more likely to be classified as “normal” according to BMI than a taller individual of similar build. Has something to do with the height being squared. I’m not sure at what height a person is considered too tall or too short for BMI to accurately reflect classification. BMI tends to work best for classifying inactive people. 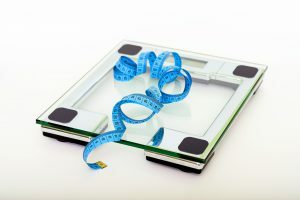 Researchers determine BMI’s accuracy by comparing it to that individual’s body fat percentage, more about that in a sec. Waist circumference is an easy one to measure. Body fat percentage can be a little trickier. Several different methods out there, but for the average person working out in their home gym, you’re probably gonna figure it out with a pair of calipers or a tape measure. You take a few measurements and compare them to a chart. I want to discuss this further in an upcoming post. Most accurate way is to submerse yourself in a water displacement container or use air to measure in one of the “Bod Pods”. These are more difficult and unless you are an elite athlete working out in a state-of-the-art fitness center, you probably will have to do some work to find one. I appreciate you bearing with me while I explore this whole “BMI” thing. I was motivated after being told by a doctor’s office that I was overweight (very impersonally I must add… “hi”…”here’s your BMI”…”you’re a little fat”…maybe not those exact words, but that’s what I heard). 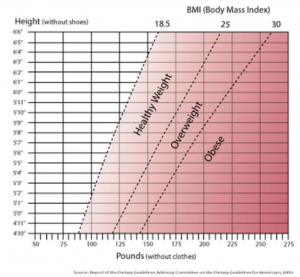 The way I look at it, BMI is by no means perfect, but I guess it’s a good place to start. Better than nothing anyway. A lot of us, especially if we have been exercising for a while, kinda know what our comfortable weight is. We may have an ideal weight, or a goal weight that we are working toward, but most of know when we are overweight. We feel it. This brings me to a more important issue…people, we need to be weighing ourselves! You should know what you weight. You shouldn’t be that surprised when you go to the doctor’s office. Personally, I like to weigh myself at least 1x/wk to see how I’m doing. But, if you don’t know what your “ideal” weight is, knowing your BMI is a good place to start. Check your weight circumference too, it’s easy enough. Try to make sure you are less than 40 in if a guy and less than 35 in if a girl for improve health. Losing weight will correspond to smaller waist circumference. 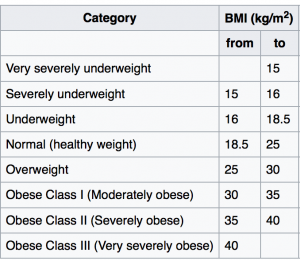 So, in a long-winded manner, the answer to my question “What should my BMI be?” … between 18.5 and 25. Im at 25.6. My ideal weight is 190lb. That would put me at 25.1… still overweight, oh well. I’m a fairly fit guy and my waist is well under 40 in. I guess I can live with my BMI telling me I’m overweight. I hope you enjoyed the read, please leave a comment and tell me what you think about BMIs or any other tools you use to keep your weight where you want it. 6 Of The Best Spin Bikes For Home Use- A Must Read Before You Buy! Hey Will, nice break down of the BMI. I was shock at mine being a wopping 69%!!!! Looks like I am pretty up there, and after long thought on your article…….which by the way took about 2 hours, I have now come to the conclusion that I need a massive make over. I new I was overweight I just didn’t no how bad. Because of this I have decided that I need to lose some serious weight, so while thinking about your article I am going to spend 45 min of the day working out with weights, and 3 days a week either jogging or walking on the school track that is literally right across street…..maybe 70 ft! Thanks for the clarification of and intriguing concept of the BMI index. That’s awesome. 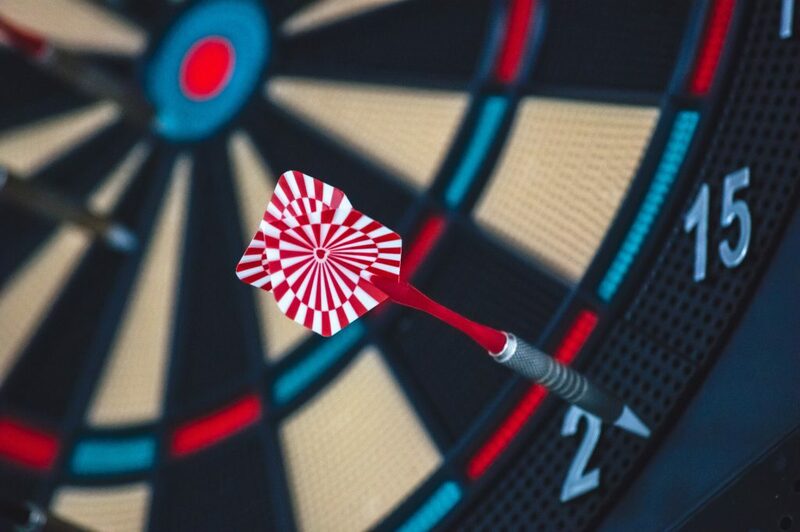 I like that you thought about your goals and came up with a realistic plan to start reaching your goals. Good idea to take advantage of the track right beside you. If any other questions or concerns come up on your journey, hit me up, maybe I can help. Thanks for reading Matthew.